Today is the half way mark of our Holy Land Pilgrimage. We have been hitting the sights so frequently and fast over the last couple of days. Today was more laid back. It was a day of traveling out of Galilee and heading more towards the southern part of Israel. We packed up from our Sea of Galilee hotel, got on the bus by 8am and headed towards the Dead Sea. Just outside of Galilee is a place called Beth-shan. This ancient city is referenced in 1 Samuel 31:10. It is where the Philistines after killing King Saul and his 3 sons hung his body on the city gates. Beth-shan is also the largest excavation sight in all of Israel. It has an incredible theatre, amphitheatre, bathhouses, ancient toilet rooms (see pic), temple, and is very well preserved. It is the capital city of the Decapolis Cities. A set of 10 cities that Rome built in Israel. Beth-shan means House of Rest. It was a place for the Romans to rest, play and be entertained. We saw the amphitheater where, no doubt, Christians would have been fed to the lions and where Gladiators would have fought and died. 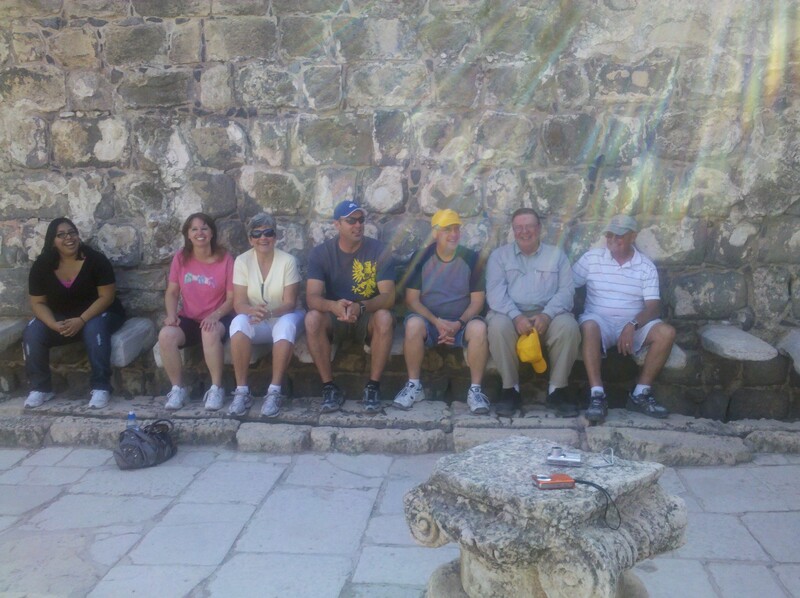 Some of the group climbed the nearly 200 steps to the top of the site where the temple for this City was built. It was a pagan temple. 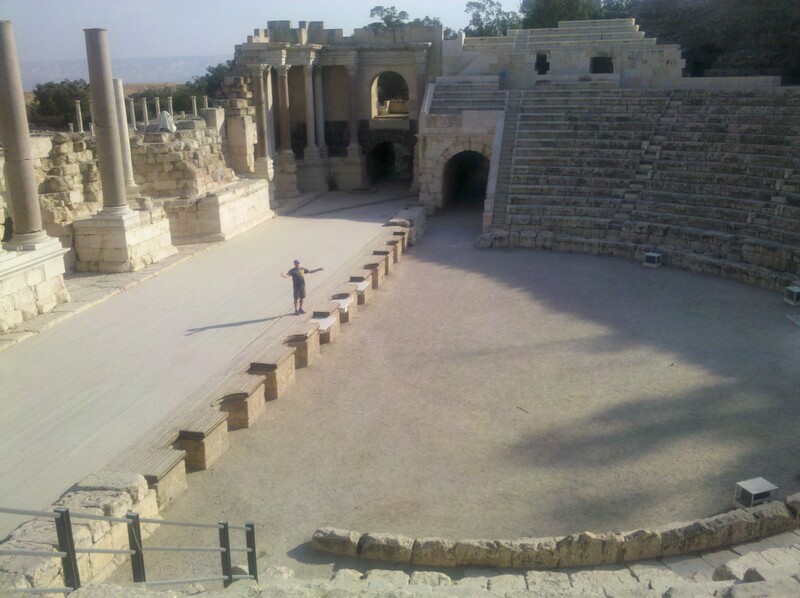 The theatre where performances of singing and dramas would have taken place could seat up to 5000 people. I stepped on the stage and sang a couple of lines of opera and after embarrassing myself enough I had to stop. See pic. Next trip I’ll plan on performing a whole song. After Beth-shan we headed further south and stopped to see a large sycamore tree. One just like Zacchaeus would have climbed when he wanted to see Jesus. We then drove to a place called Hebron, which is just outside of Jericho where we stopped for a break and snack and some people purchased the famous Hebron Glass. It’s the only place in the world to buy this glass. They hand blow it into goblets, plates, mugs, vases, etc. The glass is so hard that the owner of the shop smacked two wine glasses together and they didn’t break. Many people bought some of the products and had them shipped home so they didn’t have to carry them on the way home. We then drove by the ancient ruins of Jericho. “The walls came a tumbling down!” Jericho is known as the oldest city on earth. Excavations have dated it back to nearly 10,000 years ago. The excavations have proven that the walls did really tumble down. After Jericho we traveled further south and checked into our hotel. Along the way the hotel called and told us they were overbooked and we thought we were in for some bad news. What happened though, made everybody’s day. The travel company we booked this whole trip with upgraded us to the Crown Plaza!!! What an amazing place. So we checked into our upgraded hotel and everybody quickly changed so they could exit out the back of the hotel and experience floating in the Dead Sea. I can’t even describe the sensation. The Dead Sea water is so full of salt that you are buoyant when you get in it. You cannot drown in the Dead Sea. The salt content of the Ocean is about 3%….In the Dead Sea…30%. The water has the consistency of Baby Oil. You literally let your feet come up and out in front of you and without moving a muscle you float. 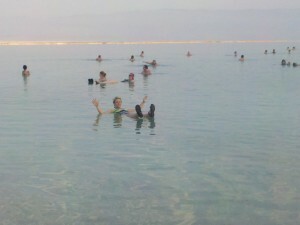 You could lay back and read the newspaper in 100 feet deep Dead Sea Water and without moving a muscle just float! See Pic. The Picture is of Colleen (sorry if I didn’t spell your name right, Colleen) The Dead Sea is literally the Lowest place on earth….it is nearly 1500 feet below sea level. Some of the people in the group purchased the famous Dead Sea Mud and rubbed it all over themselves out on the beach, let it dry and if you ask them they say it took off 10 years of age!! There is no doubt that after swimming in the Dead Sea it leaves your skin incredibly soft. Just don’t tell the guys I said that! That’s it for today. It was mostly a travel and recovery day. Tomorrow we hit it hard again as we will visit Masada, Bethlehem and more locations I’ll blog about later and then check into our hotel rooms in JERUSALEM! Again…I wish you were here with us. It has been an amazing trip. And it gets better tomorrow. That all for now. Tune in tomorrow. Did you know that Tuesday is the favorite day for people of the Jewish Faith to get married? Its because Tuesday is the 3rd day of the week and on the 3rd day of creation God said, “It is Good,” twice. 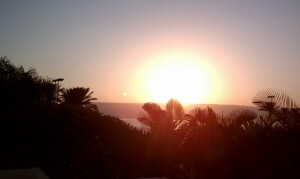 This great day started out with a beautiful sunrise upon the Sea of Galilee. The picture from our balcony says it all. We got ready for our day by having a great breakfast together and loaded up the bus by 7:30 AM to go for an hour boat ride on the Sea of Galilee. As we got on the boat, the men from Galilee raised the American Flag and played the national anthem just as we were taking off. Kinda cool! Everybody was in awe of the beauty of the lake. Kelli and I took the opportunity for a photo op. While on the boat I asked the boat drivers to turn off the engine of the boat and allow us to come to a stop in the middle of the Sea of Galilee. We sat there in silence and listened to the waves sloshing against the boat. I imagined Peter and John and some of the others sitting in that very spot fishing. After some quiet on the Sea we opened our Bibles and talked about the stories that took place on this location. Jesus and Peter walking on water. Jesus sleeping in the bottom of the boat to be awakened and He got up and told the wind and waves to be still. They obeyed!! The story about Peter jumping out of the boat and swimming in to meet Jesus on the shore after He had risen from the dead. While out on the lake we pointed out the places on shore where Jesus fed the 5000 & 4000. The location where Jesus healed the demon possessed man and the demons were sent into the herd of pigs and the pigs jumped off a cliff into the sea. The place where Jesus pointed to “The city on a hill” and how we would never put a lamp under a bushel. The hill where Jesus taught the Sermon on the Mount. The places where Jesus told Peter he would become a “fisher of men.” What a boat ride! As we docked the boat and unloaded we immediately went into a museum right off the Sea of Galilee that found and preserved the remains of a boat dated back to Jesus’ era. It helped us understand what kind of boat Jesus traveled in and the Apostles fished from. Pretty cool. We then loaded up the bus and drove to a location I have not been to even though this is my 3rd time to Israel. The place is called Dan. It took us an hour to drive to the far North of Israel (Isreal is the size of New Jersey) where the Lebanon/Israel borders meet. Dan is fortress that Jeroboam moved a group of Israelites to and urged them to worship false Gods. He built an altar where children were sacrificed to these false gods, made a golden calf that they prayed to. Jeroboam was an evil king of Israel and you can read about him and the place we visited in 1 Kings 12:25-33. The sight we visited was in very good condition even though the time of Jeroboam was nearly 1000 B.C.! Just around the corner of Dan we visited what is considered the Canaanite Gate. Before Israel even existed the Canaanites ruled. This gate entry we saw is referenced in Genesis 14:14. Abraham’s name was still Abram. This gate is where Abram came to rescue Lot. Yes…the Lot of Sodom and Gomorrah. We took a group picture here. This gate is ancient. We’re talking around 4000 years old. Again…Genesis 14! Wow. See Pic. After that amazing site we stopped for lunch. Falafels again! I could eat that for lunch every day. The next sites we hit were all sites that we spent about 15 minutes at each location. So much to see…so little time! We went to Caesarea Philippi where there was 3 cult temples built, one of them worshiping the false god “Pan.” Pan was part goat, part man…played a flute. It was at this site where Jesus asked the Apostles who they thought Jesus was. Peter replied… “You are the son of God!” Jesus rewarded his faith by telling him the keys of heaven were given to him. This site also is where they considered the “gates of Hades” to exist and that’s why Jesus said on this spot… The Church will prevail and the gates of hades will not!” There was a large cave that looked like it descended into darkness thus got nicknamed the gates of hell. I didn’t get pics of it, but if you check out facebook, lots of people on our trip took pictures. Right after this visit we shot off again and this time to the Mount of Beatitudes where we stood on the ground where Jesus taught about how to be blessed. “Blessed are those who are poor in spirit. Blessed are those who…read the whole Beatitudes section found Matthew 6:17 and following. It says that Jesus climbed up a hillside and sat down and taught. Our group stood and look down a hillside where there were many chair sized rocks that Jesus could have sat and taught from. You can’t imagine how powerful it is to stand on the ground where Jesus actually stood! We then went to the location where Peter was asked by Jesus, “Do you Love me,” 3 times. We were able to walk down to the water front and see and smell and feel the beach where Jesus spent much of His time right off the Sea of Galilee. 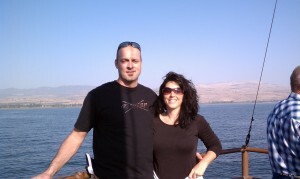 We then went to Capernaum. 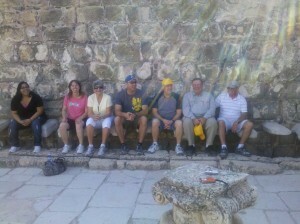 This is the location where Jesus healed the paralyzed man that some men lowered through the roof. 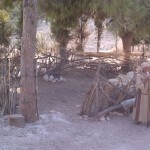 We visited Peter’s Mother in Law’s home where Jesus would have slept on occasion. It was in this home that Jesus healed Peter’s Mother in Law and she got up and made them dinner. We know this is the spot of Peter’s home because of the engraving they found from the 1st Century. 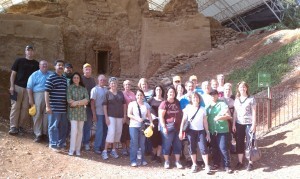 We visited the ruins of the synagogue where Jesus would have spent time teaching the people. Capernaum is a place that doesn’t have any life in it today. Jesus cursed it because of the people’s unbelief. Matthew 11:21. It was also in this town where Jesus said, “You must eat my flesh and drink my blood.” Again…an amazing historical sight. It was inspiring to walk around in the place. After Capernaum we had one final spot to get to before the day would be over. The Jordan river where we had some people on our trip who wanted to be Baptized where Jesus was baptized. So we had to rent white robes and towels and we got into the cold waters of the Jordan and I baptized around 10 people. The place was packed. There were people from all over the world. You could hear all the different languages and see all the different skin colors. Jesus is pretty amazing. He can unite and He can divide. He said He is the Alpha and the Omega. All the different types of people at this one location gave us all a glimpse of what Heaven might look like. All those baptized gasped as they came up out of the cold water. Some cheered, some cried. What a cool moment. I will never forget it. Wow! What a trip and we haven’t even been to Jerusalem yet. I hope your Tuesday went well. Mine was magnificent. I’m exhausted. If you are worried about your family or friends who are with Kelli and I on this trip. Stop worrying. They are all eating together, laughing and getting to know each other very well. They will come back united with one another having experienced a life altering trip to the Holy Lands. Everybody was on the bus this morning 5 minutes early. There was eagerness in the air. We woke this morning to the Mediterranean Sea waves gently rolling onto the beach outside our hotel window. (Really suffering for Jesus!) We got a great nights rest and the Jet Lag had dissipated. Everybody was ready to get into the history of their Christian roots. We got on the bus. Its a tour bus like you see in the states. Air Conditioned. Travel is first rate on the Parkway Holy Land Tours. We headed north from Tel Aviv to the Galilee area. Much of north Israel reminds me of the areas of California and some of the Phoenix and Flagstaff area. There is a mix of palm trees, pine trees, and Oak. There are rolling hills everywhere with lush shrubbery. We saw banana trees, crops of every kind. It is a fact that America sends scientists to Israel to study how to do an advanced drip system for irrigation. Our first stop was to the historic sight of Megiddo. Megiddo is referenced throughout the Old Testament and also in the book of Revelation. If you take the Revelation passage literally then the Valley of Megiddo is where the last battle will be fought where Lucifer is defeated by the King of Kings and His angelic Army. We call this place the Valley of Armageddon. Megiddo is a city that dates back up to 5000 years ago. Archaeological digs have found 25 different civilizations built on the sight. When one civilization was established and a king and his army came in and defeated it…they would level the current city, fill in the gaps with dirt and build right on top of the now destroyed city with their own culture and architecture. Imagine this happening 25 times. It literally is a man made mountain. On this sight they discovered an ancient Altar that is approximately 30 feet wide. The altar is a giant circle made from unhewn stones just like God directed the Israelites to build for sacrifices. There is no doubt that Solomon would have participated in animal sacrifices on this very altar. The Battles fought around this site where fought by many of the great “celebrities” of the Bible. Debra, Solomon, Ahab, Jezebel, Gideon and more! As we walked into the site we walked up steps that Solomon would have walked on. If those steps and walls could only speak. How many incredible stories would they share? We journeyed through a long tunnel dug by King Ahab to provide water to the city. Very cool place. After about an hour or so we departed to Mount Carmel. This is the site where Elijah did the competition with the prophets of Baal. (1 Kings 18) It is a high mountain where you can see for miles throughout Northern Galilee. Just at the base of this mountain Elijah had all 800 false prophets slaughtered. It is fascinating to stand on the ground where this all happened and try to imagine it actually taking place. Right after Carmel we had lunch at a local place where the group got is first taste of Falafals. Google it and you’ll see what it is. What the Cheese Burger is to America…Falafels are to Israel. It is fried Chickpeas, lettuce, cabbage, tomatoes and humus…all stuffed in a Pita. I love them. As I type this I crave another one already! 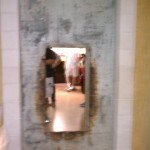 From this site you will also see a photo of a “gate” or door. There are two doors in one. One large door and and a smaller one built into the large one. Jesus’ teachings come to life when you think about him saying…”enter through the narrow gate.” He also taught, “its easier for a camel to go through the eye of the needle than for a rich person to enter heaven.” The small opening in the photo is also called the eye of the needle. Nearly impossible for a camel to get through. When we were finished at Nazareth Village we headed to Mount Precipice. This is the traditional location where Jesus’ “friends” and some family tried to kill him by throwing him off the cliff. You can read the story in Luke 4:14-30. It is amazing to think that so many people had the Messiah right there in their presence and they rejected Him and tried to kill him. I thought often today about which crowd I might have been in if I were alive when Jesus lived on earth. Would you have taken Him at his word or would you have been in the crowd that didn’t believe. I’d like to think I would have believed. What would you have thought if one of your neighbors or your cousin while at a community gathering stepped up and said…”I am the Son of God, the Messiah.” Would you believe or would you try to throw them off a cliff? We ended the day by driving to our hotel which is built on the literal shore of the Sea of Galilee. Some in our group walked out onto the patio and leaned on the rail and looked out on the waters of the Sea and tried to imagine Jesus walking on that very water. What a trip so far. Most of the sites we started with aren’t really personal…they are more historical. Tomorrow we start the day with a boat ride on the sea. Visit Capernaum and the location where Jesus fed the 5000. The sites we start seeing tomorrow start getting personal and emotional. What a trip. I hope to bring you here in the future! Stay tuned! The locations are getting better everyday! I’m off to bed. I hope your Monday goes as good as mine did. I do wish you were here with me. So we arrived at Tel Aviv Airport at 9am. We met up with Vivert and Neelam Lall. They are missionaries in India that we support as a church and they are joining us for this tour. We were originally planning on going straight to our hotel to freshen up, rest and get ready for the Tour to begin early Monday Morning. Our Tour Guide is named George. He suggested we go to Caesarea Maritima before we check in. Sounded like a good idea, so we did it. Caesarea is a place that King Herod the Great built off of the Mediterranean Sea to impress all the world travelers that arrived by ship. (Most places we go to on this trip were built by Herod the Great…(He is the Herod who killed all 2 year old and under males during the time Jesus was born)…Caesarea has a Hippodrome where they had chariot races, 4000 seat amphitheater, a temple, palace guard and a really advanced port for ships. The only biblical significance of this place is from Acts 10 and Acts 23-27. Peter was at this place. The Apostle Paul to. We were all pretty tired. Weather was in the mid 80’s…a bit warm. Jet Leg had set in…we looked like a bunch of zombies. 30 plus hours had elapsed and we have only had about 4 or so decent hours of sleep depending on how well one sleeps on a plane. We had a quick lunch at a local place and checked into our hotel for one night. We checked in at around 2:30 pm. Most of us were wiped out. We chose to eat dinner later on our own and most went and took a nap. BAD IDEA. Kelli and I crashed for a “quick” nap. Well I just now woke up and now it is 10PM and I’ve just slept for 6 hours. My body thinks its AZ time still and so I’m typing this from our tiny bathroom using the closed toilet as my desk seat and trying to not wake Kelli up. This first hotel is what I would rate as a 2 star hotel. We have two small beds. By small I mean my shoulders literally touch each side of the bed. its like a Half twin. But…better than a plane seat! I”m working on killing the Jet Lag. So I will try to force myself to sleep more. We get up in the morning and will go to the Sea of Galilee. I’m sure our Parkway adventures truly begin then. Wish you could be with us…how about the next trip? November 2012. Stay tuned…Sea of Galilee is next. I might try to walk on water…..what……don’t role eyes…Peter did! We’re at Sky Harbor and sitting and waiting to load our plane to Newark NJ where we will switch rides and have a 9 hour flight to Tel Aviv. I was a bit anxious about the TSA stories I’d been hearing about full body scanners, full body pat downs that rank right up there with molestation…but we had none of that. Piece of cake getting through security! In fact one of the TSA agents caught everybody’s attention. He smiled and was giving everybody thumbs up when they went through the metal detector without setting it off…saying with a smile and raised eyebrows, “you made it!” He graciously helped those who forgot to remove a piece of metal from their pockets. He was shouting out reminders about what to do and not to do. He loves his job. But…maybe he doesn’t love his job, but chooses to enjoy what he has to anyway. With his positive attitude, I’ll bet his day goes by faster. He could have scowled, frowned, grumbled, demanded. Instead he chose to make us smile, relax and anticipate. He chose to serve instead of demand…give instead of take. That is the America I’m proud of. So…as you head off to work…what attitude will you choose. You HAVE to work today. Will you choose to lift and encourage or tear down and destroy? Go to work. They’re calling our row…gotta go!